Tennis happens to be one of the most well loved sports in the world today. When we think of tennis, we usually think of table tennis and lawn tennis. There are tournaments and championships held for both kinds of tennis. 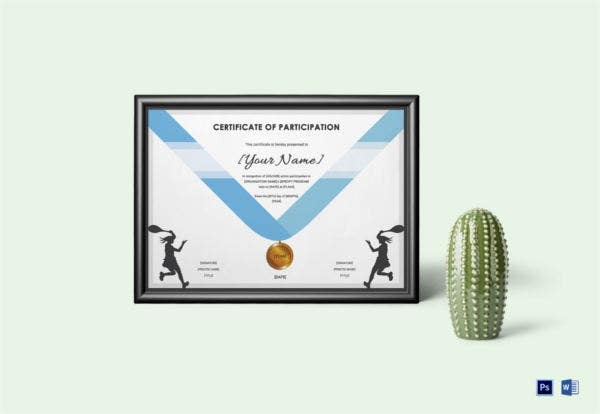 In order to design the free certificates for these, you can take the help of the tennis certificate templates provided below. These have been designed specially for the occasion and would be of great help to you! The first thing you notice about the certificate template here is the border which has been kept simple but elegant. That is well contrasted against a subdued background. Also, the template comes in a standard size. 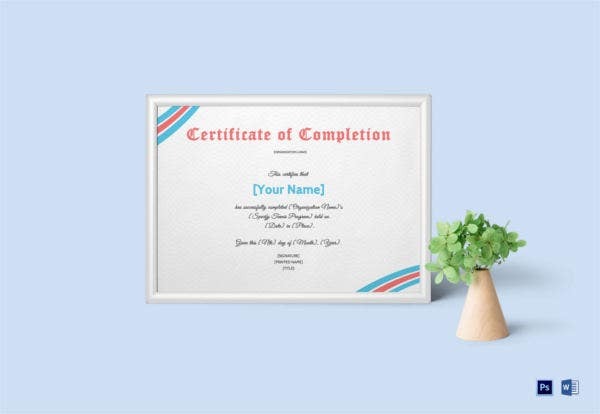 This certificate template comes with an attractive background theme, appealing patterns, easy customisation of colour and text and also Word compatibility. That makes the template exceptionally easy to edit. 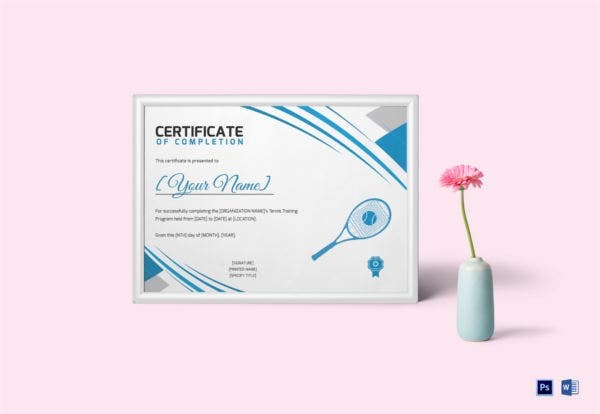 This tennis certificate comes in a Word or PSD format, a print ready layout, a standard size with bleed, a CMYK color mode, high resolution of 300 dpi, and easy customization of text and color. 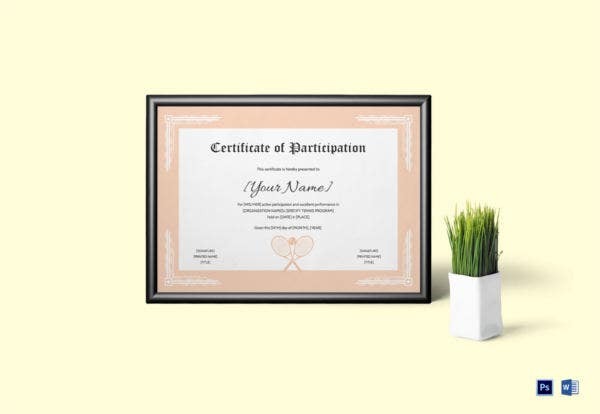 The peach coloured border in the template along with the subtle cream background looks really attractive in this certificate. Also, the template is 100% editable and customisable as well. Plus, it is Word and PSD compatible. One look at this template would tell you exactly what it is about. This template sticks to the tennis theme which makes it appropriate and relevant for any competition or tournament. 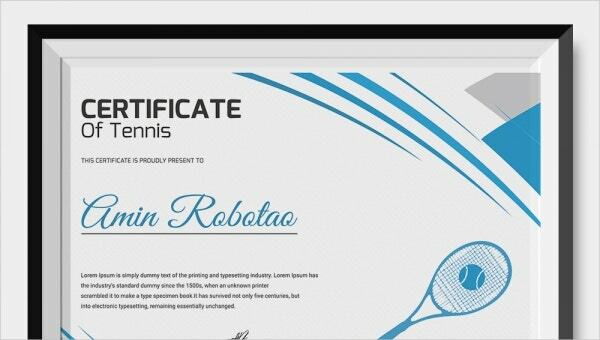 > What are the different kinds of Tennis Certificates? Tennis, being such a popular game, has a number of events organised. Based on that, there are several different kinds of certificates as well. For instance, one cannot use the same certificates for lawn tennis and table tennis. You would need separate certificates for each kind of game. Similarly, you would have to segregate the competitions and the championships. What kind of a tournament is it? Once you answer this question, you would be able to choose a certificate for yourself. Also, you receive a certificate once you finish coaching for tennis. The certificate templates may come in handy there as well. > What are the Basic Components of Tennis Certificates? The name of the person being certified must be written in clear well defined terms. Some other details may also be included although that is left to the designer. The certificate must have a clear border. This is of utmost importance. You can also see Wrestling Certificate Template. All the elements of the certificate must be organised properly on the certificate in a tidy fashion. The purpose of the certificate must also be mentioned. Without that, the certificate wouldn’t be complete. 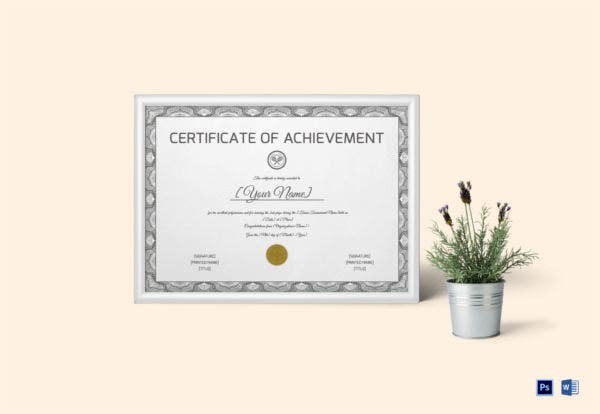 By now, you have a fair idea of the different kinds of tennis certificates and the basic components of such certificates. You can go through the collection and just download the one that catches your eye. It couldn’t be simpler than that!